In this lesson, we start by investigating the different types of fronts that are commonly analyzed. Next, we address two different types of cold fronts: classic (stacked), and katabatic. Then, we identify the main characteristics of these frontal types and what sets them apart from each other in conceptual models and in water vapour imagery. 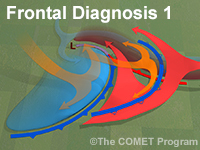 This is the first lesson in a two part series that addresses three different types of cold fronts and how to diagnose them. Characterize the differences between stacked cold fronts and katabatic cold fronts. Identify the main characteristics of stacked/classic cold fronts. Identify the main characteristics of katabatic cold fronts. Distinguish frontal type by observing satellite imagery.